The pre-production part which consists of preparing your assets for Golaem Crowd (i.e. the character skeleton, geometry, props, shaders and the motion clips). This is represented by the first step of the workflow picture below. The production part which consists of using the assets to create a crowd shot. This is represented by the steps 2 to 6 of the workflow picture below. Due to Maya performance issues, as you can see in the workflow picture above, the actual character geometry will not be used at simulation time: it will be only loaded on-demand at Simulation Layout / rendering time. Although we provide a GPU-accelerated way to preview the character geometries at simulation time. This explains why the simulation needs to be exported before being rendered (step5). 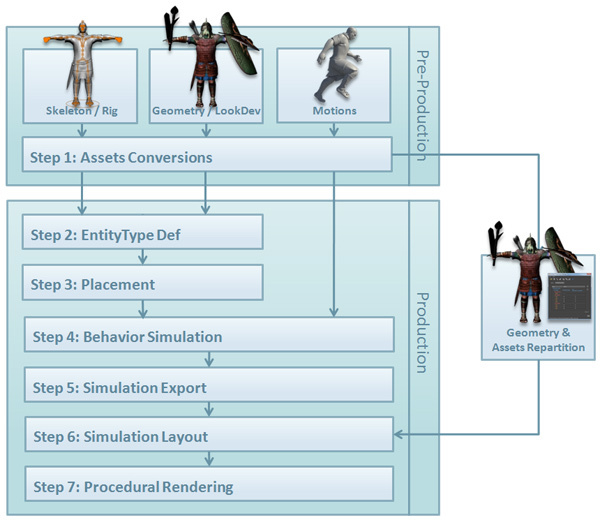 convert your motions clips (either mocap or keyframe animations) in the Golaem Crowd motion file format (.gmo). For more information about how Entities, Entity Types, Rendering Types & Behaviors interact, please refere here. You can also follow the Quick Start for an overview of the complete workflow.